2014+ Fiesta ST 1.6L Turbo - 3" Stainless downpipe, 304 grade mandrel bent stainless piping and stainless flex with carbon steel flanges. Has 2 stock location 02 bungs. 3" throughout and a brief reduction to 2.5" at the end. Proven to be effective on a stock turbo then used on our bolt-on GT/GTX turbos for use beyond 400HP as is. 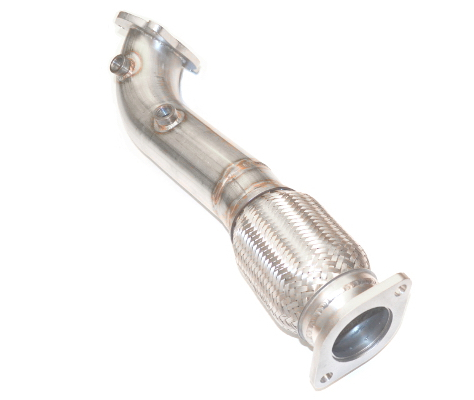 Just like our Front Mounted intercooler kit, this downpipe is built to be used for stock turbo or upgraded turbo at HP levels all the way to the 400HP so you only have to invest in the downpipe once in the life of the car.